One Swayze vehicle I enjoyed (in my childhood) was Black Dog (1998). If you're in the mood for a fun, ludicrous action flick, it's recommended. Meat Loaf Aday and Randy Travis co-starred. 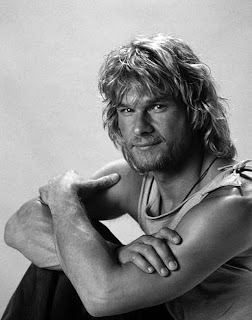 I wish Swayze had chosen his projects better, but I'm thankful that he at least got to work with Coppola and Milius. Nice thoughts here, Tony. I too agree with what you say about Point Break and Swayze's performance as Bodhi. I have to say that I actually love Road House...it's a great drive-in action movie made the way they don't make them anymore. It's gratutious and ridiculous -- the way action movies like that should be. Plus, I think he and Sam Elliot are having a lot of fun in the movie playing super cool bad asses. It's sad that Swayze never got out from under the shadow of Dirty Dancing. I love Red Dawn, and two recent performances that are sometime overlooked are his supporting role in Donnie Darko, and the starring role in a minor film Green Dragon...both showed a range of emotions that were rarely on display because of the lack of quality in the roles he was offered. Apart from Ghost, Point Break, liked his supporting act in Donnie Darko, as the celebrity self help speaker, with whom Donnie has a tiff. He was pretty good in Ghost, showcasing his comic side especially in the scenes with Whoopie Goldberg. Another talented star gone. May he rest in peace and may his death be an inspiration in finding a cure for pancreatic cancer. As he said earlier this year "I want to last until they find a cure, which means I'd better get a fire under it." Yeah, POINT BREAK is probably my fave film of his. He really committed to the pulpy material all the way and really stole the film away from the "star" Keanu Reeves -- not too hard considering his stiff acting style, but it plays well off of Swayze's philosophical surfer/bank robber. And you can just see in many of the scenes it looks like Swayze's having a total blast with the role, getting to do all those crazy physical stunts. It's interesting to see this film kinda getting rediscovered. It has been on cable TV all summer and I've watched it countless times and each time I enjoy it more and more and that's because of Swayze's top notch performance. I have watched Red Dawn many times. When I first saw it, I expected it to be a shoot-em'-up with a happy ending. When it turned into a serious examination of the effects of violence, and when Swayze delivered his powerful performance as Jed, I was pleased and amazed.